Would you like to whip up a super cute, easy, chocolate-free Easter treat? 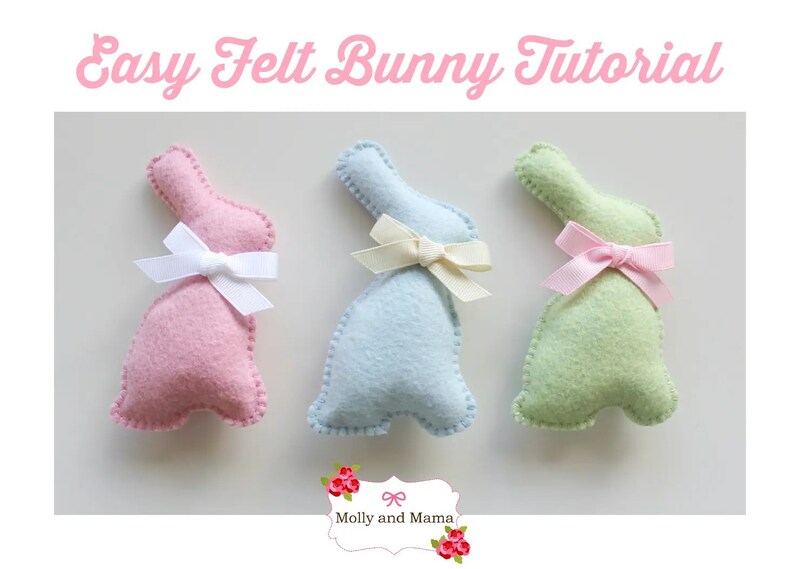 This little felt bunny template and tutorial was originally designed for Issue 10 of Tickle the Imagination Magazine. It’s so simple to stitch. Download the template HERE and save it, so that you can print it whenever you like. 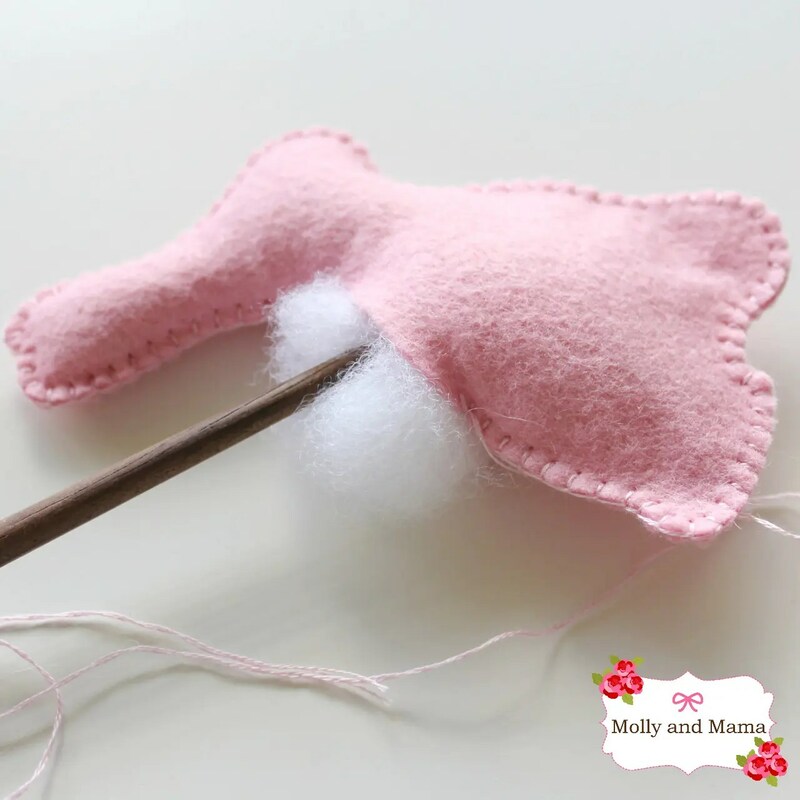 Use your favourite method to cut out two bunny shapes from felt. I describe my favourite techniques in my blog post; How to Transfer Templates to Felt. You can use freezer paper to get a very accurate shape, or use the simple method described below. 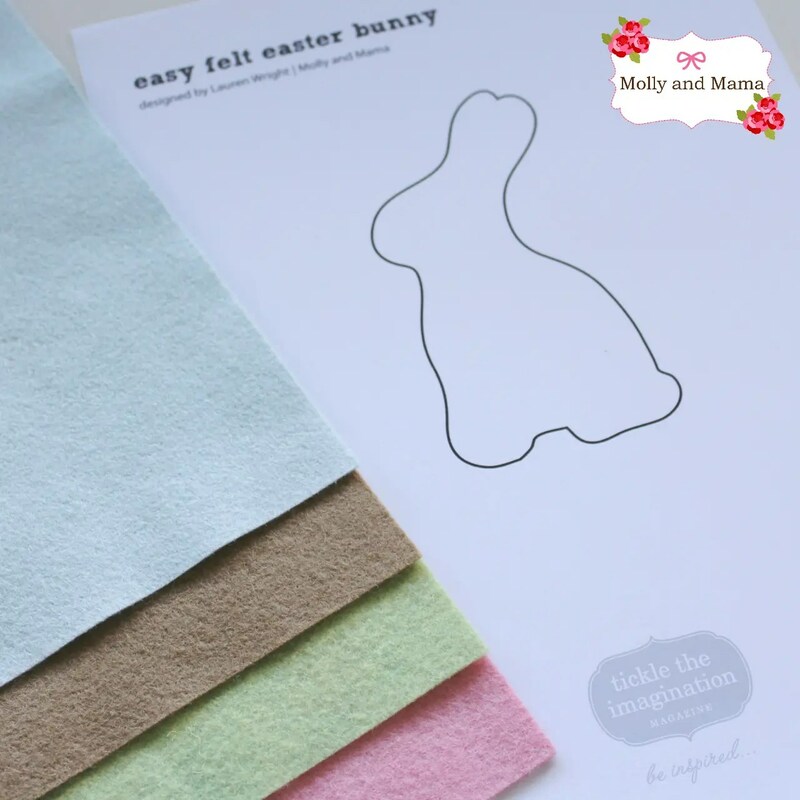 Cut out your printed bunny template following the black outline. 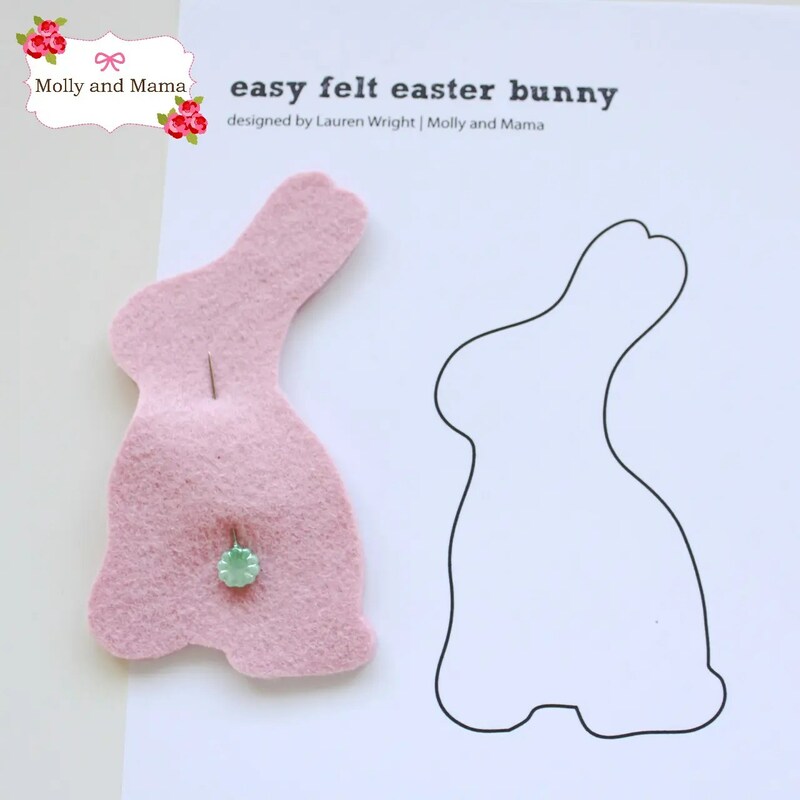 Fold your piece of felt over and pin the bunny pattern in place (through both layers of felt). Cut carefully around the bunny template. 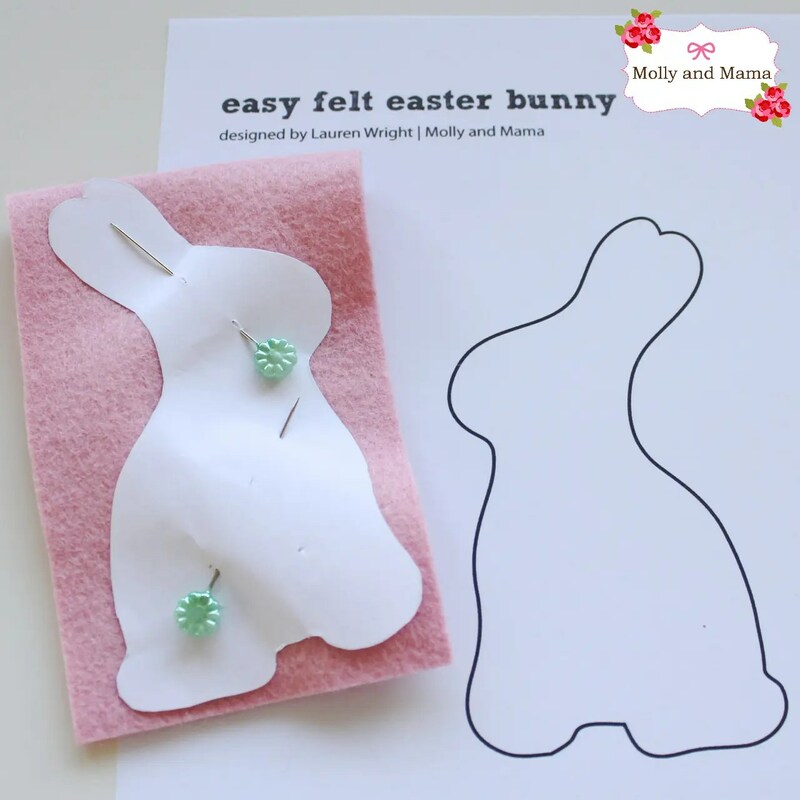 Remove your template (and save for later) and pin your cut out bunny together. Thread your needle with two strands of embroidery floss and secure the ends with a knot. Stitch around the outside of your bunny using the following guidelines; Start at the back of his head (so that any untidy stitching can be covered with the neck bow added at the end). 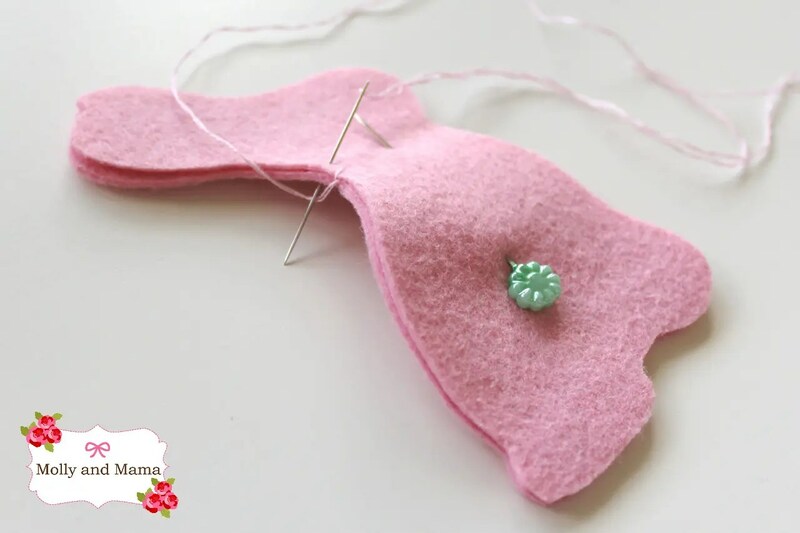 Use a ‘blanket stitch’ to keep the felt neat. However, if you are new to hand stitching, an ‘overcast’ or ‘whip’ stitch’ will work just as well. If you have a young one trying their hand at stitching, start with a ‘running stitch’. 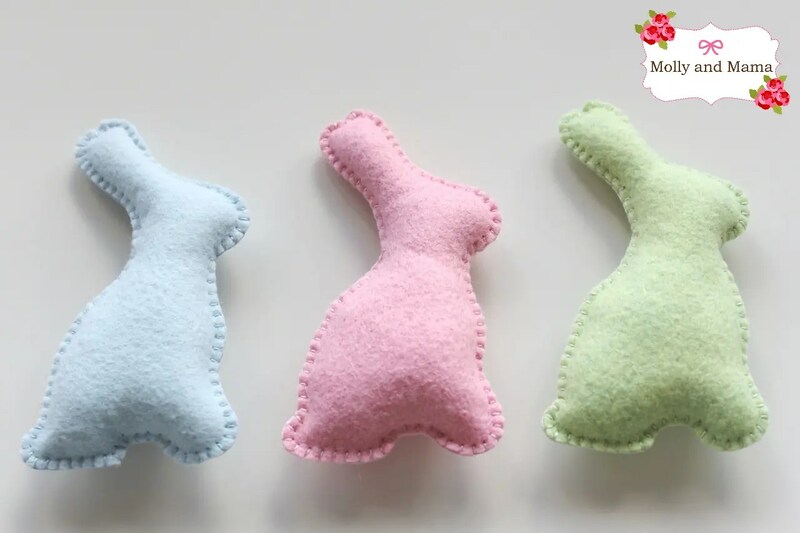 TIP – If you need help here, there are some wonderful images and video tutorials posted online that can easily illustrate the stitching process for you. Depending on the length of your thread, you will probably need to re-thread your needle with more embroidery cotton, more than once. Make sure you hide the knot of the end of your floss inside the felt layers each time you start sewing with a new length of floss. Stop stitching about an inch (or 2.5cm) before you meet up with where you began. Don’t finish off your stitch though, and make sure you leave the thread where it is, so you can finish off the stitching after you add the stuffing. Carefully and gently manoeuvre small pieces of stuffing inside the bunny. A chop stick or knitting needle is a great tool for this! Fill the ears and head first, then the feet and body. Add little pieces at a time until the bunny is evenly stuffed. 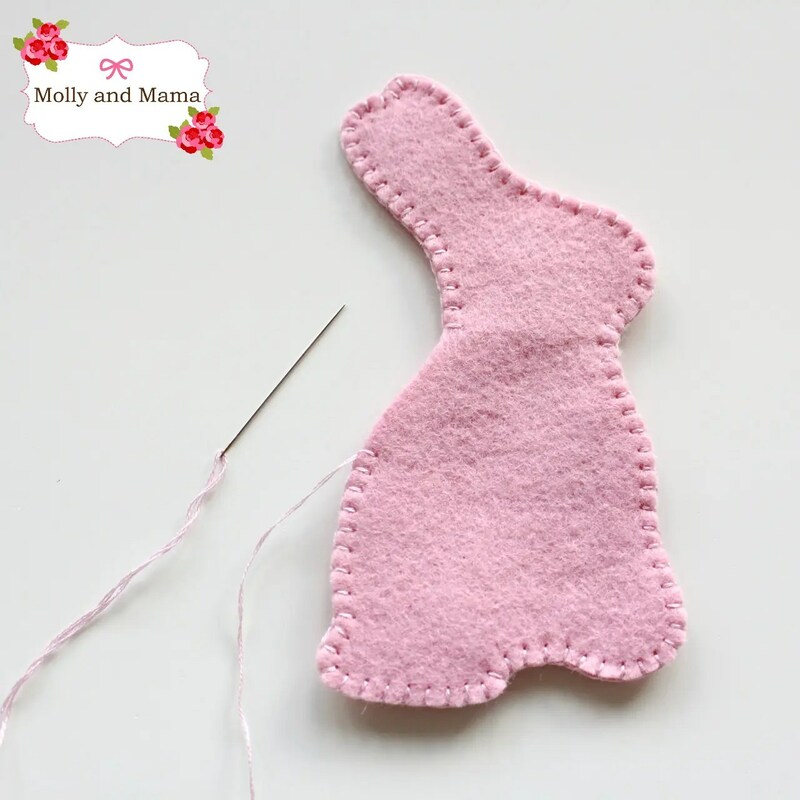 Pick up your needle and thread again and continue to stitch the bunny closed, making sure you secure the stitching with a couple of extra stitches at the end. 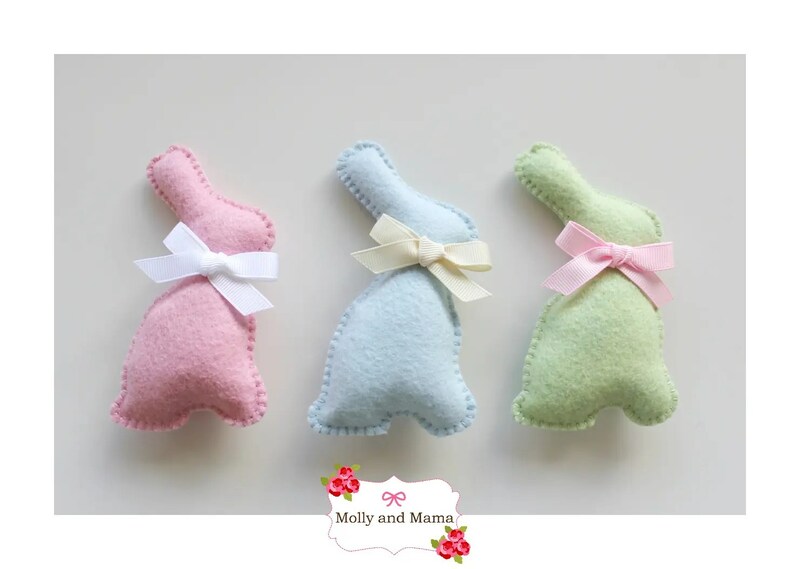 You should now have a lovely little stuffed bunny, or two, or three (if you’re loving them as much as me!). To finish off your bunny, tie a pretty bow around his neck. Trim the ribbon ends to the right length, once the bow is complete. It’s also a good idea to heat seal the ribbon ends so they don’t fray. You can do this by carefully running the small flame from a cigarette lighter across the cut end. It will melt and seal the ends to stop them fraying. This is obviously a step for adults only! If being used by small children, it’s best to secure the tied bow with some strong stitches to prevent the ribbon being removed during play. Now your little bunny is all ready for Easter! Enlarge the pattern to create a range of bunnies in different sizes. Use different colours of felt, thread and bows in coordinating tones. Perfect for creating an Easter centrepiece! You can also personalise your bunnies by adding names, initials or other embroidery details. I show you how in this blog post. If you liked stitching these bunnies, you might also like the other Easter patterns in my store. The Bitty Bunnies has always been a popular one. They’re teeny tiny bunnies that live in their own cute carrot sleeping bags! And the Rosie Rabbit Ornaments look terrific on the Easter Tree. You can make them in any colour you choose! I hope you’ve enjoyed this tutorial and have learnt some tips and tricks along the way. You can also see my other free tutorials HERE. Thanks so much! They’re so easy to make too! Thank you Meriel. Bunnies are a favourite around here too! I’d love to see one when you do! Happy stitching! Very cute – pinning it for later! I love adding ideas to my Pinterest boards too. A great way to organise all those great projects we want to try! Adorable! This would be a great kids sewing project, too. It sure would. Such a great beginners project! I’m printing this out now to try with my daughter! Thank you for the lovely tutorial. You’re so welcome! Happy stitching! AMEI os trabalhos, cada um mais lindo do que o outro!!! Parabéns! It’s so cute Adri. Thanks for sharing! I love these so much..
Love the little bunny. Thanks for sharing the tutorial. Thank you Elizabeth. I am glad you like it!